Durian (thurian, in Thai): the fruit that people either love or hate. Unfortunately, many people hate it because they try one that’s not very good. People who eat a good variety, ripe, and a reasonably large portion to begin with, usually like it. It’s a fruit like no other. I think if you were tasting it blind and had never had it before, you might not believe it’s a fruit: perhaps a custard of some kind. It is very rich. 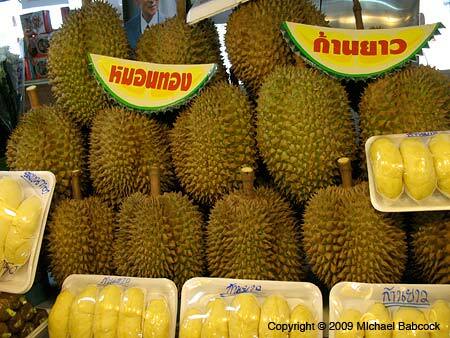 Aw Taw Kaw Market in Bangkok is an excellent place to get durian. It can be pricey there; but you can also get very, very good durian indeed. This picture shows one vendor’s wares at Aw Taw Kaw. She’s offering two varieties of durian: the sign to the left says (in Thai script) mawn tawng (“golden pillow”) while the one to the right says gan yao (“long stem”). Of the two varieties, mawn tawng is much more common; gan yao is the tastier (and more expensive) variety. Vendors there are typically generous with their tastes, trying to rope you in: they hope you’ll buy a package. I’ve never seen them sell an individual piece, just a package, such as the three in front – those large yellow lumps are the fruit, which grow incased in the brown outer coverings above. Don’t ever sleep under a durian tree! They are as spikey as the look! The gan yao variety is truly delicious. However, it can get expensive, even in Thailand. One time we bought a plate that had perhaps 6 or 7 of the fruits and it was 2,000 baht — at today’s rates (about 34.5 baht to a dollar), that’s over $50.00 U.S. And it was worth it! For more on Aw Taw Kaw Market, see Michael’s blog entry Pad Thai at Aw Taw Kaw Market. For more on Durian (including photos), check out Kasma’s article on the website: Durian, King of Fruits. 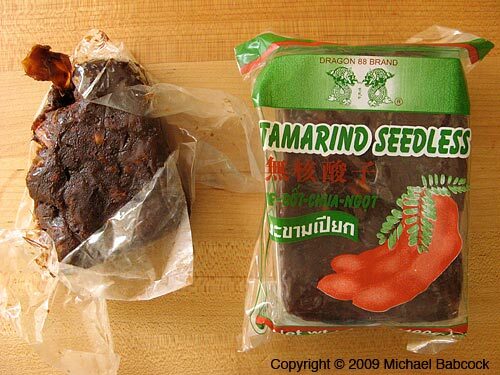 To many people, tamarind (makahm or makamin Thai) is an unknown ingredient. To most seasoned Bay area cooks, the word “tamarind” conjures to mind a tart, dark brown fruit – a beloved and essential souring agent used in many tropical cuisines, from India and southeast Asia to Africa and the Americas. Held by stringy fibers inside curved beanlike pods, the moist, sticky fruit is protected with a brittle, reddish-brown shell. These fresh pods can frequently be found in specialty produce stores and in Asian and Latino markets. To use, the flesh is removed from the shell and the fibrous strings and hard seeds are discarded. It can then be chopped up to make chutneys and dipping sauces. More frequently, it is mixed with water, the soft pulp dissolved to make a thick, smooth, dark brown concentrate that is used to add a pleasing fruity tart flavor to soups, salads, braised and stir-fried dishes. The concentrate is also used to make refreshing drinks such as tamarindo, and is frequently added to curries to heighten their flavors and to marinades to flavor as well as tenderize meats. 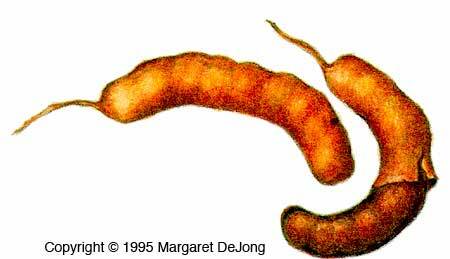 However, not all tamarind is sour. In fact, the fresh tamarind pods found in many Asian markets at this time of year are actually sweet tamarind, some without the slightest hint of sourness. This “best variety” sweet tamarind are not meant for cooking, but for eating fresh by itself as one would fruit. It makes a wonderful, nutritious snack. At other times of year, Asian markets may carry unripe tamarind. Though brown on the outer surface, the shell and seeds have not fully developed and are not separate from the green flesh. Southeast Asians pickle these immature pods, eat them fresh with a sweet shrimp sauce, or chop and incorporate them into a tamarind chilli sauce for accompanying raw or blanched vegetables, fried fish and grilled meats. Because of the variation in fresh tamarind pods and their availability, more consistent results can be obtained in cooking by using prepackaged forms. 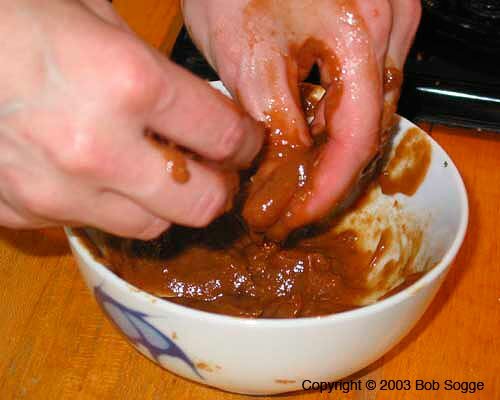 Ready-to-use tamarind concentrate or paste is available in plastic containers. I personally prefer to use the compressed blocks wrapped in clear plastic and labeled as “wet tamarind,” or simply “tamarind,” to make my own tamarind concentrate when I need it. These blocks are made up purely of the dark brown flesh of sour tamarind extracted from the pods, with the fibrous strings and most of the seeds removed. When I buy one of these blocks, I usually squeeze the package and select one that feels the softest, as it will more likely be fresher, more moist, easier to work with and yields better-tasting tamarind juice. The block should also look a rich dark brown and not black. To make tamarind juice or concentrate, break off a one-inch chunk of wet tamarind paste and mix with a quarter cup of water, using your fingers to knead and mush the soft part of the fruit so that it melts into the water. Work the tamarind until a brownish fluid the thickness of fruit concentrate results, adding more tamarind paste or water as needed. Gather up the undissolvable pulp and any seeds with your fingers, squeeze out the juice and discard. Making your own tamarind juice concentrate when you need it ensures a fresher tamarind flavor than pre-mixed concentrates. An added advantage: the tamarind block does not require refrigeration, whereas pre-mixed concentrates do after the containers are open. Store the compressed block well-wrapped in plastic in a cool place in your pantry. See our website for more information on tamarind (makahm). This recipe is also available on our website (Spicy Tamarind Tiger Prawns) where it is available with Notes and Pointers. Shell, devein and butterfly the prawns. Place in a bowl and add 1 tsp. of salt and 1/2 cup of water. Mix well to dissolve salt and set aside for 10 minutes. Then drain off the grey water and rinse several times to remove all the salt. Drain well and let sit to warm to room temperature before stir-frying. Heat the oil in a small skillet for 2-3 minutes. Add the sliced shallots and fry over low to medium heat, stirring occasionally until the pieces are evenly browned and crisped (may take 10-15 minutes). Drain from oil with a fine wire-mesh strainer. Return oil to skillet and fry the garlic over high heat until golden brown. Drain likewise, reserving the oil for stir-frying. Heat a wok over high heat until its entire surface is hot and smoking. Swirl in 2 Tbs. of the reserved oil to coat the wok surface. Wait a few seconds for it to heat. Then add the dried chilli pieces and fry quickly until they begin to darken. Toss in the chopped onion and fresh peppers and stir-fry until softened and aromatic. Add the Sriracha chilli sauce, soy sauce and palm sugar and season to the desired sourness and saltiness with tamarind and fish sauce. Stir well to blend, heat to a sizzling boil and reduce a minute or two to thicken. Add the prawns and with frequent stirring, cook over high heat until the sauce is thick and the prawns are cooked to your liking (2-4 minutes). Turn off heat and add the fried shallots and garlic. Toss well. Transfer to a lettuce-lined serving platter. Garnish top with slivered green onion and cilantro sprigs. Serves 6 with other dishes and rice in a shared family-style meal. Serves 6 with other dishes and rice in a shared family-style meal. Kasma teaches this recipe in her weekend Series Set A (class 2). 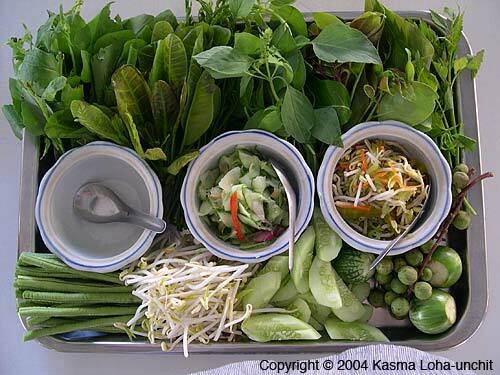 There’s many more of Kasma’s Thai recipes on the website. Written by Kasma Loha-unchit, July 2009. There are numerous types of one-dish meals that are common all over Thailand, such as this one. 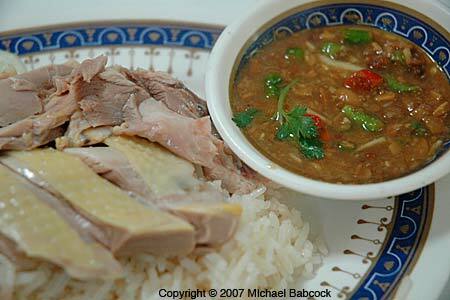 The Thai name is Kao Mun Gai, composed of the words kao (rice), mun (oil or fat) and gai (chicken). When Kasma teaches it in her classes, she calls it Poached Chicken Rice with Melon Soup and Hot Fermented Soybean and Ginger Sauce. It consists of a chicken (Kasma usually uses a capon), which is poached, and then served over rice that has been cooked in the rendered chicken fat (the mun portion of the dish) and in broth from poaching the chicken – much like an Italian risotto. It is served with a simple broth with winter green melon or fuzzy melon (not pictured) and a spicy fermented soybean and ginger sauce (shown in the sauce dish above). When done well, it is succulent, juicy chicken served over rice rich with chicken fat and a good bit of pizzazz from the sauce. 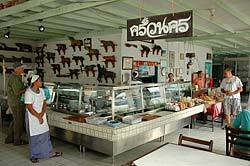 It is often seen as a street food and there are also shops that specialize in the dish. You can recognize where it is sold by the plump, whole chickens hanging on display. This picture was taken at a shop in Songkla, in the south of Thailand. Kasma teaches this dish in her Advanced Series Set D (class 3). 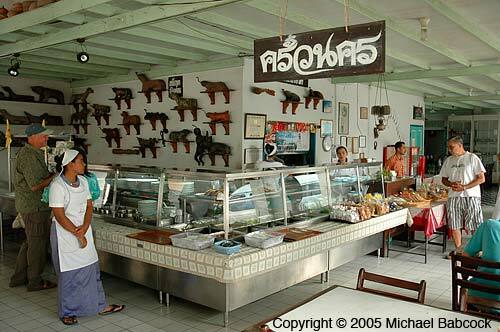 Krua Nakhon is a great restaurant for breakfast and lunch in Nakhon Si Thammarat. 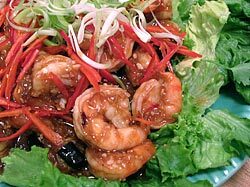 Note: In our visit in February 2012 we found that Krua Nakhon has closed down and re-opened with an expanded menu in a new location near the Provincial Court in Nakhon Si Thammarat under the name วังเดิม – Wang Derm. See our blog Wang Derm Restaurant (formerly Krua Nakhon). Over the years we’ve visited this city in the South of Thailand many times. We go there on Kasma’s trip of southern Thailand and it’s also one of the places where we like to travel on our own. I like it because of the way the city feels – the people are friendly and it’s a colorful, interesting place. In addition to the main temple, Wat Phra Mahatat, with it’s soaring main chedi (stupa) and interesting Buddha statues, there’s a lively Sunday open-air market, a fun night market and places to purchase southern crafts such as yin lipao baskets and shadow puppets. Kasma’s driver, Sun, lives down here and we also get to visit his family compound, where he lives with 6 of his other 7 siblings. We always stay at the Nakhon Garden Inn, a reasonably priced, comfortable hotel, which even has free wi-fi. In the morning we invariably walk a few blocks over to the courtyard containing Bovorn Bazaar on Ratchadamnoen Road at the Thawang Intersection, a few blocks from the Train station; there we breakfast at the restaurant Krua Nakhon, meaning Nakhon Kitchen. The word nakhon means city, and cities such as Nakhon Si Thammarat are often referred to simply as Nakhon. The restaurant is open daily from 6:00 a.m. to 3:00 p.m., so it’s a breakfast and lunch place. It is an attractive sitting area, open on three sides and all times. On the wall behind the counter is a collection of antique coconut graters. Food is served cafeteria-style – you go up to the counter and pick out what looks good to you, order, and the friendly staff will bring your selection to the table. Close by is a place to get coffee or tea – Hao Coffee. You can order it at Krua Nakhon and they’ll go place the order for you; or you can go to Hao Coffee yourself and see what looks best. Once you order, they’ll deliver it over to Krua Nakhon for you. We recommend the “Blue Mountain” coffee. In Thailand, Blue Mountain refers to a type of roast or blend, and not coffee from Jamaica. It’s quite tasty. When you sit down at the table there will either be a large platter of fresh vegetables and pickles, or the staff will bring one over to you. This is something that you see throughout Southern Thailand. They are eaten as an accompaniment to the meal. They can be used to help cut the heat of a particularly spicy dish. Krua Nakhon specializes, not surprisingly for a southern Thai restaurant, in southern Thai dishes. One of my favorite dishes there is the Rice Salad, the Kao Yam Bpak Dtai. When Kasma teaches this dish, in her evening Advanced Series Set E (class 2), she teaches it as Southern-Style Rice Salad with Assorted Vegetables and Aromatic Herbs, Toasted Coconut and Boodoo Dressing. It’s an attractive dish, a bit like a composed salad. 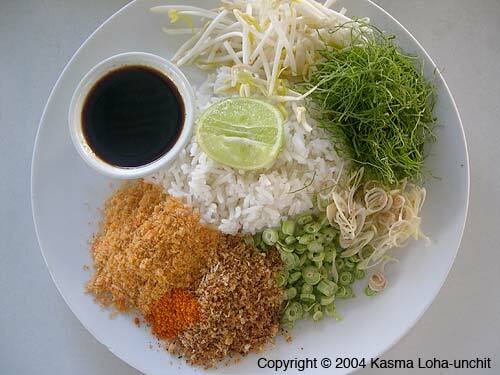 The rice is in the middle surrounded various other ingredients, such as lemon grass, dried shrimp, shredded coconut, bean sprouts, shredded greens and a dish of boodoo sauce). You mix everything together, squeeze some lime on top and enjoy, eating it along with the scrumptious fresh vegetable and pickle platter that is on every table. You can also get kanom jeen, fermented rice noodles served with the topping of your choice. These noodles are the only noodles that originated in Thailand; the other types are Chinese in origin. 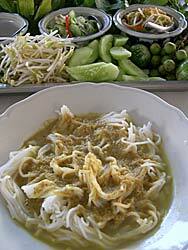 Kanom jeen are served all over Thailand but in the south there’s a couple toppings that are very popular. The topping shown in the picture above is spicy fish Nahmyah curry sauce. It’s also good with green curry on top. In addition, there are always a number of other dishes. You can choose to have them served over rice or over the kanom jeen noodles. Be sure to get a dessert. Check the counter for what they have that day. 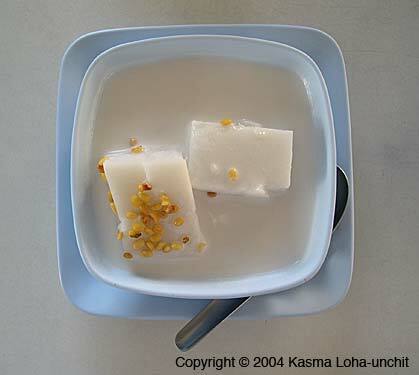 They usually have several options of different items in coconut milk, such as the picture here. These coconut-based dishes are especially good if you’ve just eaten something very spicy – the coconut will cool down your taste buds. There’s some more information and pictures about Krua Nakhon on my personal website. 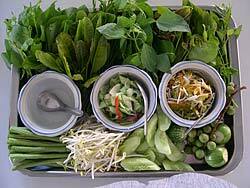 Another great southern Thailand restaurant is Ruen Mai in Krabi. Written by Michael Babcock, July 2009. At temples I enjoy looking at the murals and the details on the buildings. One of the “must see” sights in Bangkok is the Grand Palace and, in particular, the temple of the Emerald Buddha. Around the temple is a covered walkway that is painted with murals from the Ramakien, which is the Thai version of the Indian epic, the Ramayana. 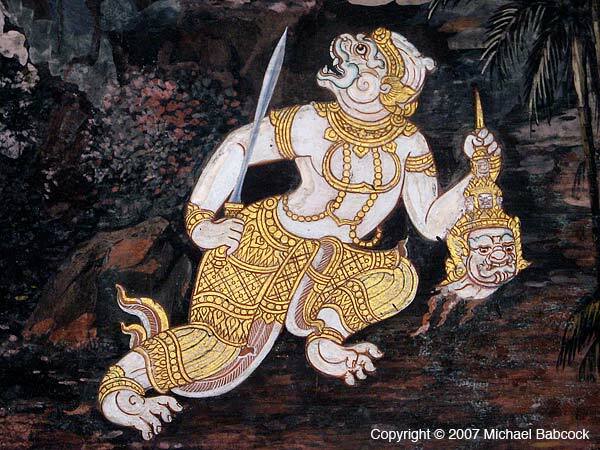 This particular portion appears to be one of the monkey warriors, perhaps Hanuman (the monkey god) himself, absconding with the head of one of the demon warriors. 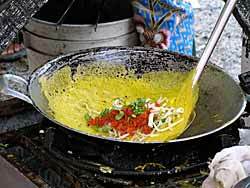 In Thailand there are two types of Crepes that you might run across, both called Kanom Buang. The larger ones are called Kanom Buuang Yuan and are made also by some street vendors and available on the menus of many Bangkok restaurants serving classic Thai or royal cuisine. The word Yuan means “Vietnamese” and refers to the Vietnamese Crepes that were the inspiration for the Thai version. In Thailand they are stuffed with a minced mixture of shredded coconut, roasted peanuts, shrimp, salted radish and fried tofu and served with bean sprouts and a sweet cucumber relish. 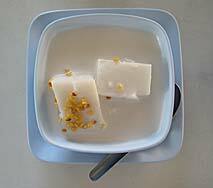 Kanom Buang Yuan is a recipe that Kasma teaches in her weekend Advanced Series, Set A (class 4). The smaller version of the crepes are called Kanom Buang Thai, to distinguish them from the larger yellow crispy crepes of Vietnamese origin. Fahrangs (that’s what the Thai people call Caucasians) sometimes mis-call them “Thai Tacos” because of their appearance. 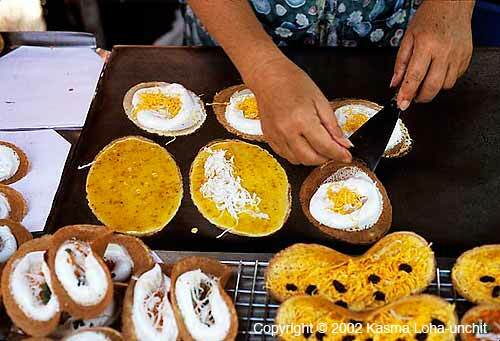 These kanom (the Thai word for snack) have a white filling often mis-identified as coconut cream; it is actually meringue – egg whites and sugar. The stringy bright yellow filling is not shredded mango but extruded duck egg yolks cooked in syrup, and the deep orange filling is a mixture of shredded coconut cooked with minced shrimp or ground dried shrimp and colored with orange food coloring (in the past the orange color came from the rich orange butter in the heads of fresh water prawns). Like many Thai sweet snacks and desserts made with eggs, the origin of this particular snack can be traced to the influence of Marie Guimar, the half-Japanese, half-Portuguese wife of a Greek minister (Constantine Phaulkon) to the Siamese royal court in the 17th century. Marie worked her way to the position of head of the royal kitchen and introduced the use of eggs in making desserts and other sweets. 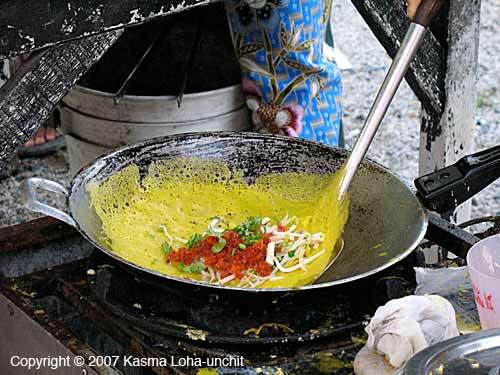 Written by Kasma Loha-unchit, July 2009.In Thailand there are two types of Crepes that you might run across, both called Kanom Buang. 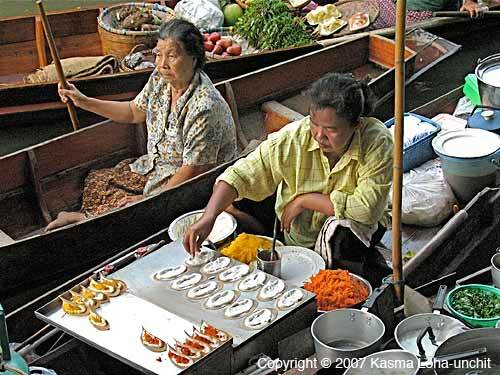 You are currently browsing the Thai Food and Travel Blog blog archives for July, 2009.